Likely named for the location of its discovery, this Brass Imperial Gallic Aquincum Helm is a traditional Roman helmet with a twist - instead of steel (or iron) construction, as would have been common, it is recreated entirely in fine brass. The helmets base design is that of the classic Imperial Gallic design, featuring a rounded skullcap, complete with stylized eyebrows on the brow. It also features a brow visor, and an extended neck plate, for added defense from behind. Hinged cheek protectors adorn the sides, allowing the helmet to stay open at the ears and face, while still providing a bit of protection to a soldiers (or any other wearers) face. Capped atop the helmet is an ornate little knot-spike, set in place of where a more traditional plume holder might go on other models. 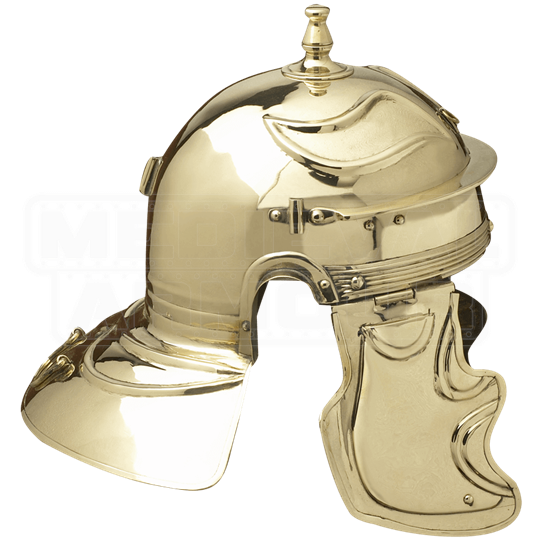 The helmet is made entirely from polished brass, and it is offered in only one size. Distinctive in its look, this helm would make for a great display piece in any collection, and the Brass Imperial Gallic Aquincum Helm would also be a perfect piece of headgear for a ranking Roman officer to wear in a reenactment, too!